Jammu & Kashmir Current Events - Heli-Service to Amarnathji via Pahalgam. 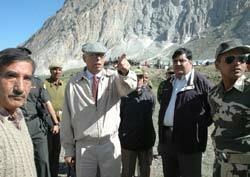 Chairman Mr N N Vohra and CEO Mr B B Vyas of Shri Amarnathji Shrine Board during visit to Chandanwari, Pahalgam. Srinagar, July 16 - Governor, Mr. N. N. Vohra, today announced launch of Pahalgam-Panchtarni heli-service for Shri Amarnathji with effect from 22nd July. This will synchronize with the relocation of helipad, for the Baltal based service, from the Holy Cave to Panchtarni on this day. Stating this during his interaction with the senior officers of the District Administration, Anantnag and Shri Amarnathji Shrine Board (SASB) at Chandanwari-14 kilometers from Pahalgam-the Governor said that the decision has been taken keeping in view the urges and aspirations of the Yatris and the local stake-holders. While appreciating the high level of synergy between the Administration, the Board and the locals in the smooth conduct of the ongoing Yatra, the Governor, who is Chairman of the SASB, emphasized the crucial need of further involving the local stake-holders such as hoteliers, tour and travel operators, tent/shopwallas, pony/pithuwallas etc, who constitute important components of this Yatra of faith and brotherhood. The Governor acknowledged the enormous contribution of the locals in facilitating the Yatra and said that this needs to be sustained and further strengthened by bringing about harmony between all the service-providers. He reiterated that the Shrine Board would create a more conducive atmosphere for all those associated with the Yatra so that each of them plays a productive role during the pilgrimage. He observed that Shri Amarnathji Yatra, a symbol of the State’s unique composite ethos, had a potential to particularly transform the economy of Pahalgam and Baltal-Kangan belt, apart from the entire State. The District Development Commissioner, Anantnag, Sheikh Mushtaq Ahmad, gave an overview of the facilities put in place right from Mirbazar to Chandanwari and beyond. He elucidated on the cooperation rendered by various departments and the locals for ensuring the smooth and regulated conduct of the Yatra. The Governor visited Panchtarni, the last halting Camp on the traditional Pahalgam-Holy Cave route, in prelude to the shifting of the helipad for Baltal based services. This follows the decision of the Shrine Board to decongest the Holy Cave periphery in a phased manner. He enquired about the facilities being provided for the ground crew and control of the heli-services from both the Pahalgam and Baltal routes and directed the Chief Executive Officer, Mr. B. B. Vyas, to create additional amenities, more essentially pre-fabricated huts, for the Yatris and service providers. The Panchtarni Camp, being the new destination for the heli-services, would require improved logistics for the smooth operation of helicopter services. The Governor went round the Camp and took stock of the arrangements made for Yatris which include lodging, catering through langars, sanitation and hygiene, medicare and supply of various utility services like electricity, drinking water and essential commodities. Thereafter the Governor flew to Sheshnag and conferred with the Camp based officers of the Board, Security Forces and the Civil Administration. He laid special emphasis on further improving various facilities at this Camp keeping in view its high altitude and the particularly arduous track from Mahagunas Top to Poshpathri. The Governor interacted with the Yatris at all these locations and enquired about the available facilities for facilitating their pilgrimage. Meanwhile, a Spokesperson of the Board stated that the ongoing Yatra has already crossed a three lakh mark with 9,743 pilgrims performing darshan at the Holy Cave Shrine till the last evening. This morning, two batches of 2,294 and 1,421 Yatris left from the Baltal and the Pahalgam Base Camps, respectively, for their onward journey to the Holy Cave. From Jammu, 1,880 Yatris left for the Pahalgam and Baltal Base Camps this morning.